Question: People say God knows everything because he watches over us all? Does he? Does God really care about what we do? If it is so why is there so much evil in this world? The following was originally written by me in Hindi and translated into English. The original Hindi version is at the end of this essay. I do not write frequently in Hindi. Therefore, please bear with my writing. It is an illusion that no one is watching you. Many people think that when no one is noticing them they can do anything. You might have also entertained similar thoughts because it is human to think so. However, it is incorrect. There is no such possibility at all of its happening. It is because wherever you go and in whatever corner you may hide yourself, in every place, every corner and in everything you will see the world. Wherever you may be, the world is always with you. Whatever you may be doing, you will be seeing yourself as your own witness. Because of these two seers it is not at all possible that no one is watching you or no one is aware of whatever you do. Where is not the world? When you live in the world and when you manage your life with the help of the world, how can you live apart from it? You might have frequently heard that the world has fallen asleep, or it has woken up. People also say the world is asleep or awake. In reality the world neither sleeps nor wakes up. It has always been engaged in work so that all the living beings can live in it and spend their lives. The world never sleeps, it is the people who sleep and awake. Our religion says that you should never think that no one is noticing you because the Self of every living being is its real witness. It means your Self indeed is inner witness. Your soul is verily your witness. He sees all and keeps a record of all your actions. He does not have the distinction of you and me. From his perspective, all are one. In his understanding the support and the doer of all actions is also One only. Since he is the witness of all, he knows about everyone, including you. When you finally depart from this world on your last journey, then he will take with him the fruit of all your actions (karma). According to that only he initiates your next life. To keep the list of your actions (karma) there is no need for any external force or mechanism. A whole universe is hidden in you. Both Chitragupt and Lord Yama are hidden in you as your very Self, and so also all the gods and demons of the universe in their own respective spheres. And according to your actions, they remain absorbed in their duties. If you are cruel and deceitful, the strength of the demons grows manifold in you. Then, they will burn you in the conflagration of cruelty and demonic nature and drown your inner universe in total darkness. If divine nature becomes predominant in you, all the gods become happy and cooperate with you in your works, making your inner world a heaven. According to this principle only, the fruit of your actions manifest in your life. Forgetting that you are an aspect of God, when you embrace egoistic selfishness and become immersed in it, then arises the great misfortune of becoming the cause and the doer of your actions and the possibility of suffering from its consequences. Therefore, do not ever think that no one is noticing you or your actions, or the world is asleep. The world sees everything as your Self from your inside, becoming your witness Self. It remains awake, even when you are asleep since it does not require rest. You cannot escape from your Self. Hence, not by escaping from the world, but by acknowledging the world and you as your witness, you should live and perform your actions. 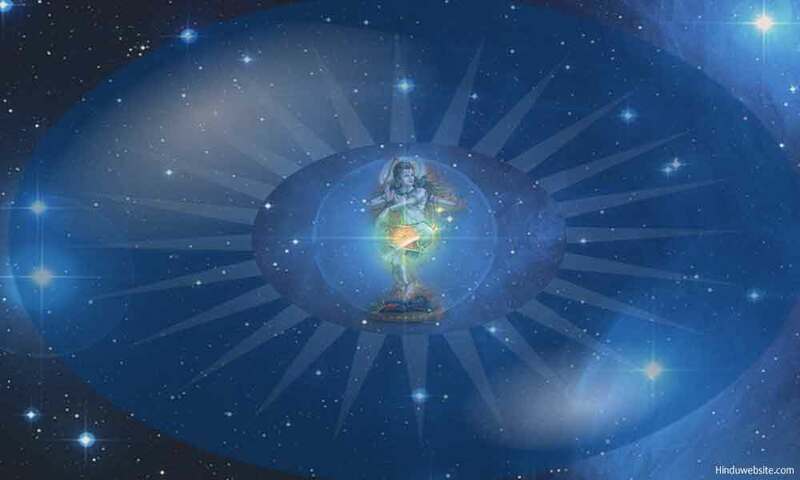 The world is a great creation of Brahman and a great aspect of his. In the Vedas, it goes by the name Viraj (the illuminated one). All the mortal beings are his aspects only, and your soul is verily an aspect of his soul. That only is the doer and the cause of your life. Therefore, fill the world in you with the effulgence of the Self and offer him all your actions, placing them before him. Then your life becomes a great sacrifice, and neither the world in you nor the world outside can ever bring you into their control. दुनिया कहा नहीं है? जब आप दुनिया में रहते हैं और दुनिया से अपना काम चलाते हैं तब आप उससे कैसे अलग रह सकते हैं?